State Rep. Bruce Franks makes a familiar gesture. 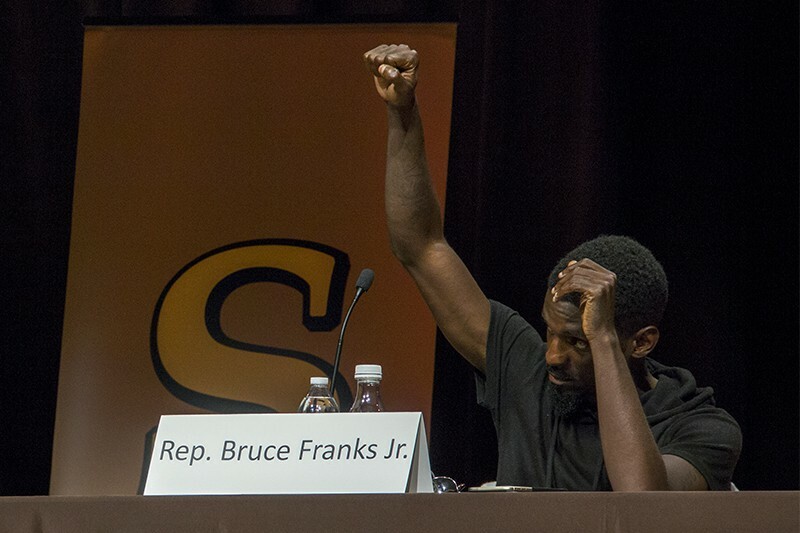 On Wednesday, state Representative Bruce Franks (D-St. Louis) did what he's done so often in the past — he raised a fist in protest. But unlike his past actions at street demonstrations or mayoral town halls, this fist was raised during the recitation of the pledge of allegiance that opened the legislative session in Jefferson City. And since you can't so much as whisper the words "civil rights protest" or "pledge of allegiance" without setting Fox News on fire, naturally the cable station's morning show Fox & Friends took a crack at the story. In a segment airing this morning, host Brian Kilmeade introduced the issue by noting that Franks had explained the gesture symbolized his commitment "to the people" rather than to the flag. 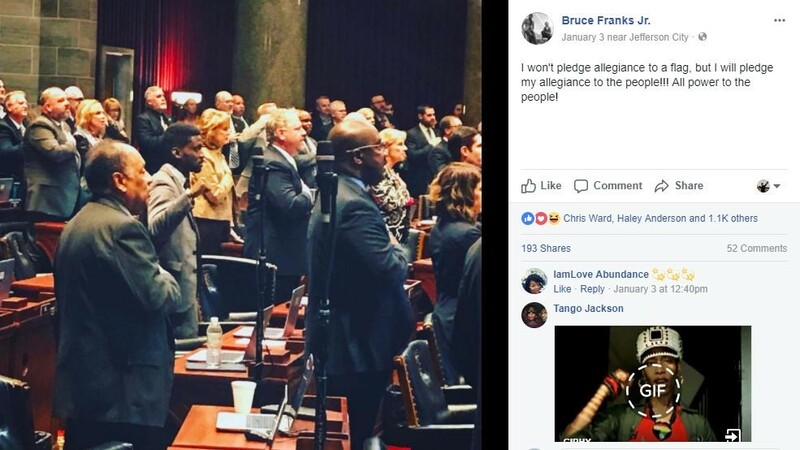 State Rep. Bruce Franks' Facebook post on January 3 sparked a flurry of local and, now, national news coverage of his raised fist. "Don't acts of defiance like this actually hurt and divide the community, some would say?" suggested Kilmeade. "Or do they bring it together, is that why he was elected?" Weighing in on the issue was frequent Fox & Friends contributor Kevin Jackson, the show's go-to guy for protests over the Jason Stockley verdict and, most recently, St. Louis' efforts to mount a gun buyback program. Unfortunately (and to the great surprise of anyone tuning in, surely) the discussion showed little insight into the problems plaguing the city. Kilmeade and Jackson wound their way through familiar territory, proving again that there's no social issue that can't be boiled down to comparisons with Chicago murder rates, "inner city crime" and the influence of Democrats — the stuff of RFT's best and most informed commenters, pretty much. "And this guy wants to raise his fist, in solidarity of what?" Jackson said. "In solidarity of Democrat rule of a city that has absolutely created problems beyond belief?" During the segment, Kilmeade also noted that Franks "has a bit of a past," apparently referencing a story published by the Daily Caller, a conservative outlet founded by Fox News pundit Tucker Carlson, which negatively highlighted Franks' history as a battle rapper and protester. "His rap name is 'Oops.' 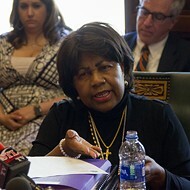 I think they could say that's the proper name for him, in terms of how he got elected," Jackson quipped. Then the pundit brought the segment home to its obvious conclusion — how President Trump is doing a damn good job. "These guys that are living on this circa-2016 muscle memory of Barack Obama's presidency and thinking that this Kaepernick-type of thing of holding up the fist is going to to mean something, they need to look forward and they need to look at the policies that are going to move black folks forward in all these cities," he said. "And they can start by stop focusing on these racial things that are dividing the country and start looking at policies, quite frankly, [that] Donald Trump is doing." Sure, buddy. Fewer raised fists; more Trump. 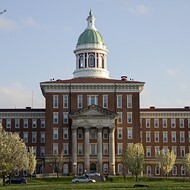 That's exactly what St. Louis needs.